To celebrate the UN International Day of Rural Women, CIFOR’s Gender Coordinator Dr. Bimbika Sijapati Basnett shares her views on the progress and the challenges for women living and working in rural areas. We need to care about rural women. For one, they comprise a quarter of the world’s population. In developing countries, they make up almost half of the agricultural labor force, and are responsible for producing and preparing food for their families. They are the lynchpin of global food security. With 76 per cent of the world’s extreme poor living in rural areas, ensuring rural women’s access to productive agricultural resources is vital for mitigating hunger and poverty. But rural women are not just conduits critical to the success of the new Sustainable Development agenda for 2030, says Dr. Bimbika Sijapati Basnett, Gender Coordinator at the Center for International Forestry Research (CIFOR). Gender equality is a goal in its own right. CIFOR promotes a rights-based approach to gender equality, which is based on the premise that assuring the well being of all humanity is a moral and ethical imperative. This framework differs from the instrumentalist argument, which asserts that women’s empowerment will lead to better economic, environmental or social outcomes. A rights-based argument does not ignore women’s contributions to promoting development and conservation, however, it does not make the granting of rights contingent on how effectively women contribute to the latter. Drawing upon her research for CIFOR, Sijapati Basnett describes the transformation of gender dynamics she has observed in rural areas. The gender shift in labor roles is particularly visible along the charcoal value chain in rural Zambia. The country’s largely undocumented charcoal trade is huge. Estimated to contribute three percent to the national GDP, the sector informally employs half a million people- including women. Charcoal production is an energy-sapping, rigorous process. Its production requires a slew of labor-intensive tasks from tree cutting to moving logs across long distances to the building of kilns. For this reason, charcoal production has traditionally been a male-dominated trade. However, in Zambia’s eastern province of Nyimba, new players are entering the game. 27-year-old Mabvuto Zulu (pictured above left and heard speaking) is a charcoal producer in Zuwalinyenga village. A mother of two, she has been in the charcoal business for four years now. Mabvuto and the women of Zuwalinyenga village are no longer restricted to carrying out the lighter tasks that they have done for years like selling bags of charcoal by the roadside; instead they are performing physically-demanding tasks previously only undertaken by men like transporting heavy logs to build the kilns. A major concern for gender scientists and researchers is that rural women are not always compensated for the extra labor they put in. Rural women are often concentrated in informal, unregulated sectors like charcoal production in Zambia and oil palm in Indonesia. Because of this, they are not entitled to the formal benefits and higher wages that come with regulated jobs. In Ecuador’s Amazon provinces of Orellana and Napo, recent CIFOR research has turned an old gender stereotype on its head. The study found that the indigenous Kichwa women don’t just work in the home and the orchard – instead, they go to the forest with their husbands to help harvest timber. Maricela Tapuy (pictured above left and heard speaking) is one of these women. Because of the high cost of labor in Ecuador, she helps her husband with the logging, rather than hiring outside help. Even though this increases her family’s income, Marciela still needs to tend to her domestic duties as a wife and mother, which leaves her exhausted. Besides contributing economically, women also play an important role in protecting their environment. CIFOR research has shown that when women are included in conservation efforts, the outcomes are more favorable. However, policymakers and development agencies need to take into account the increased workload necessary to implement conservation projects and make sure that women share the benefits. 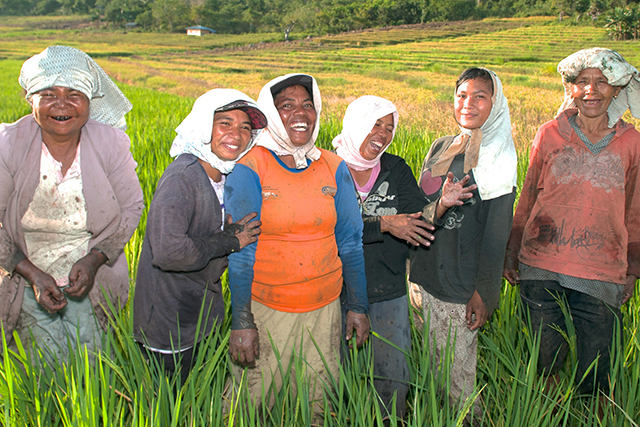 Ilah (pictured lower left and heard speaking) is a rice farmer in West Java. She farms on the slopes of the volcano Gunung Salak in Indonesia, where women traditionally practice swidden agriculture- growing rice, maize and cassava in the rich volcanic soil. Swidden is a farming system in which land is cleared for agriculture (normally through fire) and then left to regenerate after a few years. Increases in population, commodification of land and expansion of large-scale agriculture are all putting pressure on traditional swidden agricultural practices. With the help of CIFOR researchers, Ilah is now practicing agroforestry- a practice that integrates trees into agricultural landscapes. Ilah is keen to do anything she can to protect the land that feeds her family. Rural women are the trusted tenants of our land- planting the seeds that shape our collective future. For more information on this topic, please contact Bimbika Sijapati-Basnett at [email protected].